These gadgets may seem like they are out of a science fiction film but these brand new technological marvels may soon be commonplace on the high street. New technology appears to be arriving faster and faster, and these two inventions are proof of the trend for exciting new products. Combining physical and technological support is this new invention from Japanese manufacturer Fujitsu. It’s a walking stick designed to aid those who want to be active and involved in life, but gives them safety and security with its 3G, Wi-Fi and GPS technology. 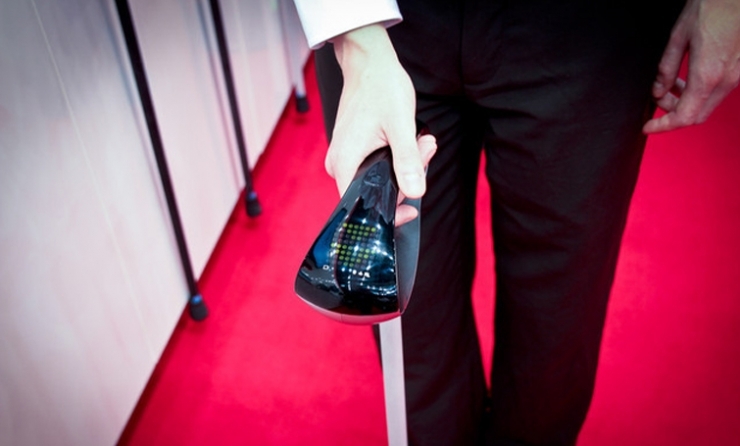 The walking stick monitors the user’s heart rate and temperature and the location can be monitored online, allowing carers or family to keep track easily and without fuss. The stick can also send an e-mail alert if it thinks the user has fallen or is in trouble, or contact the emergency services if an irregular heartbeat is detected. With an LED display on top of the handle that can help direct the user if lost and there is a vibrate function to alert the user of any danger. This product has the ability to provide old people with the safety and assurance they can continue to be active and stay safe and in contact easily. Although Fujitsu have not given a release date, this product could become a necessity for elderly and vulnerable people very soon. This is probably the most common sight in sci-fi movies, a character effortlessly sweeps through a series of documents or pictures on a screen. Never using a mouse or even touching the screen it’s all done by gestures. MYO have now brought this closer to reality with their simple looking, but very clever armband that reads the slightest muscle movements in the arm and allows the wearer to control devices from phones, to TVs to remote control helicopters. With full recognition of movement, it can detect rotation and fingertip movement for precise control, it may be expanded to medical and professional uses. The device is built to work with existing electronics and is scheduled to be available towards the end of 2013. This entry was posted in General Posts and tagged 2013, computers, electronics, inventions, Japan, job, technology, Wi-Fi. Bookmark the permalink.